Ford makes no changes to its electrified version of the 2013 Focus, which was introduced late last year. The 2013 Ford Focus Electric is sold in a single level of specification, well equipped with HID headlights, rear parking assist sensors, keyless passive entry with push-button starting, dual-zone automatic climate control, a MyFord Touch infotainment system, a Sony premium audio system, HD Radio, and more. Eco-friendly interior materials are standard, and the Focus Electric has unique front styling and 17-inch aluminum wheels that are not shared with other models. Leather is offered as an option. 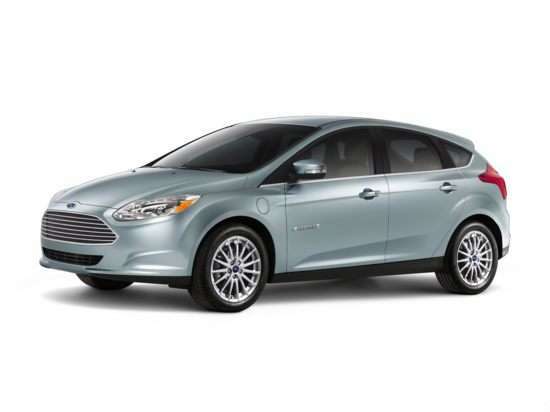 To create the Focus Electric, Ford replaces the 5-door hatchback model’s conventional drivetrain with a 107 kW electric motor, a single-speed transmission, and a 23 kWh Lithium-ion liquid-cooled and -heated battery pack. Ford does not say what the Focus Electric’s range is, except to state that it is designed to meet the daily commuting requirements of most American drivers. Top speed is 84 mph. According to Ford, the Focus Electric can be recharged in less than 4 hours using an optional 240-volt home quick charging station. Ford does not divulge how long recharging takes with a standard 120-volt household outlet, but it’s a safe bet that it requires 8 hours or more to fully charge a depleted battery. Regenerative braking captures up to 90% of the kinetic energy normally lost when slowing or stopping the car, and feeds it to the battery. According to the EPA, the 2013 Ford Focus Electric is rated to deliver 110 MPGe in the city, 99 MPGe on the highway, and 105 MPGe in combined driving. The Focus Electric comes standard with MyKey programmable features, Sync connectivity and services, an EcoRoute navigation function that helps drivers get to a destination while conserving as much battery power as possible, and MyFord Touch technology with enhancements designed to let owners check vehicle charge status, manage charging, and perform other tasks remotely. The Focus Electric is also equipped with a SmartGauge with Eco Guide inspired by “the butterfly effect” theory, which posits that even small changes, like one person switching to an electric vehicle, can have large impact. Appropriately, the gauge shows more blue butterflies the more economically the driver is driving the car.